Dynamic centre speaker from Klipsch's Reference base range sitting above the smaller R-52C centre speaker. Klipsch R-34C Centre Speaker compliments today's flat panel TVs with an unobtrusive, low-profiled design - all while delivering dynamic, crystal-clear acoustics for your movies and music. 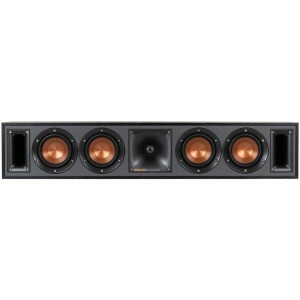 Dual front-firing Tractrix ports and a height of only 5.2" means the R-34C can be placed right against your wall or entertainment system without affecting bass response. Compliments todays flat panel TVs with an unobtrusive low profile design. Tapered array crossovers improve dispersion resulting in improved midrange definition - critical for dialogue rich material in centre channels. Exposed fasteners and low profile magnetic grilles give the speakers a polished, modern appearance. MDF cabinet has a stylish aesthetic with absolute durability that results in a seamless integration into any décor. High quality cabinet design with reinforced MDF construction reduces cabinet vibration for less audible coloration and improved sonic accuracy.